Breastfed babies rarely suffer from constipation, though babies who are on formula can sometimes have hard, difficult to pass stools. However, once these babies start solids, constipation can become a real issue. With trial and error, you’ll find that some foods are more binding to the stools -- and therefore more constipating -- than others, and a few of those foods often top the list. Rice cereal is often the first solid food that parents feed their babies. Unfortunately, it can cause constipation. Barley and oatmeal cereals contain more fiber, and therefore, are less likely to be an issue. Try these cereals first. You can also add a little bit of prune juice to the cereal to help prevent constipation. They’re yummy, but unfortunately, bananas and applesauce can cause constipation. Fruits that are less binding and help loosen stools include pears, prunes, plums and peaches. As far as vegetables, they’re all good for the digestive system. Some parents feed their children fast foods, such as French fries and pieces of chicken nuggets or hamburgers. Foods that are highly processed and high in fat can cause constipation. Also, foods loaded with sugar, such as sodas, cookies, ice cream and candies, cause constipation. Cheese is a binding food as well and should be avoided if constipation is an issue. 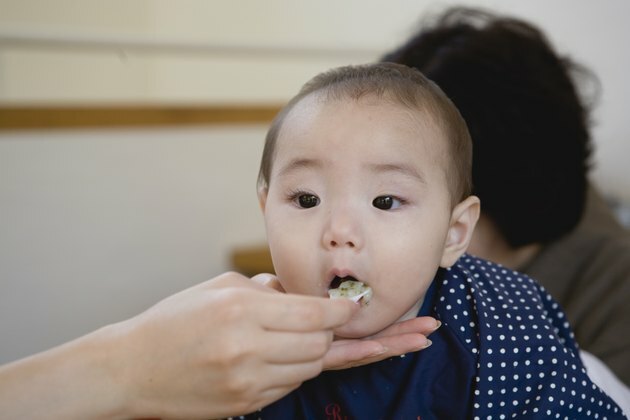 When your baby first starts solid foods, introduce just one type of food every two or three days. This eliminates the guesswork if constipation -- or an allergy -- becomes a problem. Also, provide babies who are constipated with 2 ounces of water two times a day. Do not, however, replace the baby’s formula or breast milk with water. Also, according to the California Department of Public Health, baby foods that are made at home contain more fiber than jar foods. California Department of Public Health: Is Your Child Constipated?